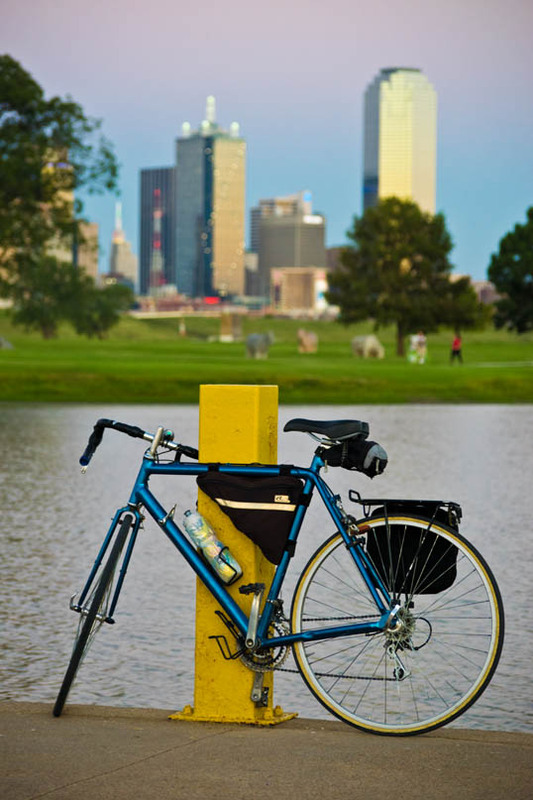 My 1986 Cannondale road bike at Trammell Crow Park. From an early part of the October Full Moon Ride. The other night I had trouble getting to sleep. I have learned to keep a bike (one of them, at least) down from the storage rack in the garage, tires pumped up, batteries for the running lights charged, and a helmet hanging from a handlebar. Better yet, keep it pointed towards the garage door. 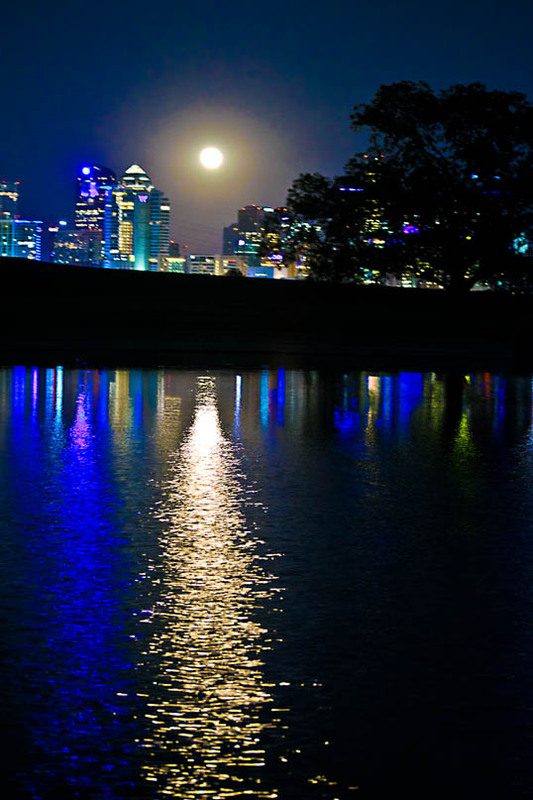 The moon rising over the Dallas skyline and the pond at Trammell Crow Park. From the October Full Moon Ride. That way, if the mood strikes, I can open the garage door, hop on the bike, and go for a short, quick ride. There is something about riding at night, going nowhere, at any speed, and for an unknown (and uncared about) distance. It is so stress free… it’s like flying. 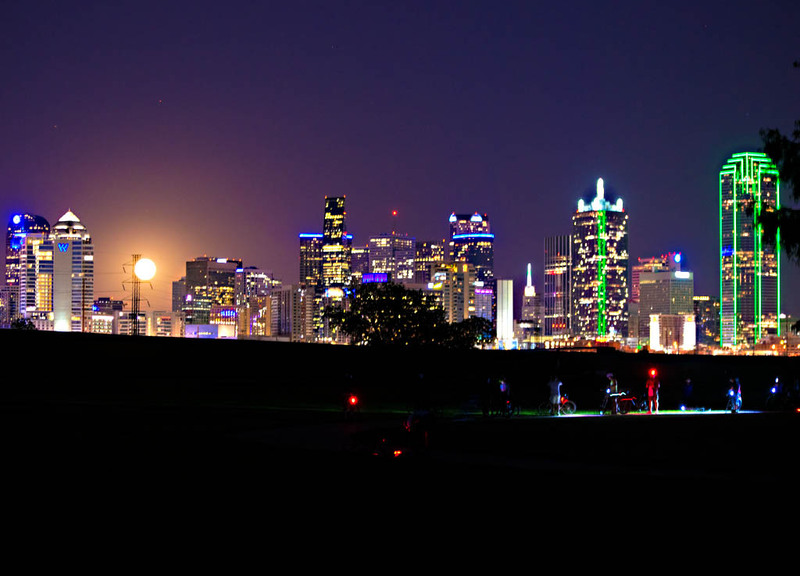 The moon rising over cyclists and the Dallas skyline. From the October Full Moon Ride. Click to enlarge. So I found myself on the trail that runs behind my house on up to Huffhines Park, with its lakes shining in the full moonlight. I veered to the right, went around the softball diamonds, and back to the lakes. As I entered the parking lot, I saw movement. Riding a bike at night, you see a lot of critters. This is the Duck Creek neighborhood, and there are, of course, a lot of ducks. Second most common are the rabbits. Also coyotes, possums, armadillos, stray pets, and even an occasional beaver on a bridge over the creek. This time, though, it was a rat. One of the sleek, grey, tree rats, caught on the ground. He and I had a little race across the parking lot – I caught him near the north end and we ran side by side, me riding off his left shoulder, his little legs a blur in the dimness. At the end of the lot he veered to the right into a drainage opening and I turned to the left to get back on the trail. I rode home, gone only a few minutes and far fewer miles, but I felt better and was able to collapse into sleep. This entry was posted in Bicycling and tagged cycling, Dallas, david byrne, nature, night, rat, richardson, Texas. Bookmark the permalink. My bike is in my living room, pointing away from the door. I think I’ll turn it around. But riding at night here in Tucson, I’d be likely to encounter a rattlesnake or scorpion. Maybe I’ll wait till morning. But Tucson is so great at night. I go there for work every now and then and I love the breeze coming off the desert at night.